During the hot and dry summer season, wildfires are more prevalent and are difficult to control. Wildfires (also referred to as veld fires) are bush fires both within and outside urban areas that have the potential to spread out of control. Most wildfires are started by people, compared to a small amount which are started by natural occurrences such as lightning. Intentional: Arson is a malicious and criminal act of delibrately starting fires. Smoking: Discarded cigarette butts can also cause wildfires, either from workers working in the fields or bush, passing pedestrians or motorists. Cooking fires: Open fires for cooking and discarded hot ashes can cause wildfires, particularly in nature conservation areas or on farms. Burning of debris: Permitted and unpermitted burning of debris, if badly managed or if weather conditions change suddenly, can cause fires. Lightning: Lightning is a cause of both wildfires and structural fires. With the wind, rather than against the wind. Faster where there is dry and dead plant material. Faster with small sources of fuel. Faster where the vegetation canopy is intertwined. Although wildfires can have devastating effects on people’s lives, property and animals, they’re also important for local ecosystems. 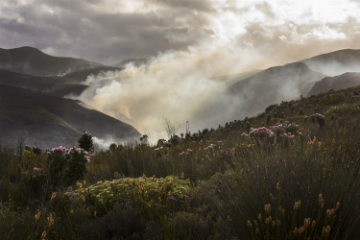 For example, the heat generated by fires help certain types of fynbos plant seeds to germinate. So, having a better understanding of wildfires can help you to be better prepared. Insignificant (blue). The fire danger is so low that no precautions are needed. Low (green). 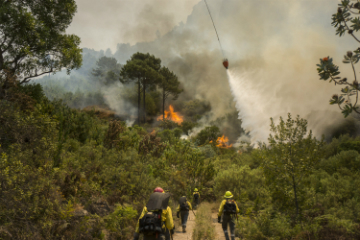 Fires, including prescribed burns, may be allowed in the open air on the condition that persons making fires take reasonable precautions against fires spreading. Moderate (yellow). No fires are allowed in the open air, except those that are authorised by the Chief Fire Officer of the local fire service, and those in designated fireplaces. Authorised fires may include prescribed burns. High (orange). No fires are allowed under any circumstances in the open air. Extreme (red). No fires are allowed under any circumstances in the open air, and special emergency fire preparedness measures are necessary. Even if the fire seems small, report it immediately. Decide whether it's safer to stay or leave your property. Wear protective clothing and footwear. Have emergency food and medical supplies ready. Move livestock to safer areas. Listen to the radio for news updates. Wet the garden and house, especially on the side of the approaching fire. Plug gutters and fill them with water. Fill baths, buckets and dust bins with water in case the water supply fails, and have mops handy. Seal any gaps between the doors and floor using wet towels or similar items. If you decide to stay, go indoors and remain there until the fire has passed. Take hoses and other firefighting equipment indoors with you. Check inside the house, including the roof cavity, and extinguish any small fires immediately. Remain vigilant after the fire has passed. Escape first, then call for help. Develop a home fire escape plan and make sure everyone in the family gathers at an agreed meeting place outside. Make sure everyone in the family knows 2 ways to escape from every room. Practise feeling your way out with your eyes closed. Never stand up in a fire, always crawl low under the smoke and try to keep your mouth covered. Practice your family emergency or home escape plan frequently with your family. Never return to a burning building for any reason. This can have severe consequences for you. During a wildfire, it will likely be dark, smoky, windy, dry and hot. There may be burning embers being blown about, no electricty, no phone service and poor water pressure. Remember, there is nothing you own that is more valuable than your life! Please evacuate immediately when asked by fire or law enforcement officials. If you're concerned, don’t wait to be asked to leave. Drive slowly, turn on your vehicle headlights and stay as far to the left side of the road as possible. No single method of communication is failsafe during an emergency, so regional public safety officials use a combination of methods to keep the public informed during an emergency. Local government public information officers can prepare and distribute press releases for broadcast by local media outlets. Public safety officials can directly broadcast messages over radio channels. First responders and credentialed volunteers can go door-to-door to alert citizens. If applicable, the local sms notification system (municipal text messaging system) can be used to notify affected residents. There's no guarantee that every citizen will be contacted, but these methods allow regional officials to quickly notify large sections of the local population. If you come across any injured animals, or if you want to volunteer, you can call the Cape of Good Hope SPCA at 021 700 4159/8 or visit their Facebook page for more information. Although wildfires can be devastating it also plays a crucial role in our ecosystems. In the hands of man fire has become a tool of evolution but if not handled correctly it can become a tool of destruction. Reduce the risks of wildfires and manage them by being wildfire ready. Help Bokkie spread the wildfire prevention message! 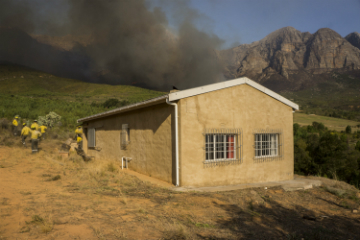 Bokkie is the symbol of wildfire prevention in the Western Cape. Bokkie has appeared on posters, billboards, and other materials to spread the wildfire prevention message. The main goal of Bokkie’s fire education campaign is to reduce the number of human-caused wildfires by promoting safe behaviour when using fire, but they also encourage a sense of personal responsibility for our country’s forests and other spaces with vegetation. While the materials in this toolkit are copyrighted, you have permission to reproduce them for use in schools. If you live in Cape Town, you can also contact the nearest City of Cape Town’s Fire Stations to report fire dangers. Be sure to save the appropriate number on your cell phone and to teach it to your children. The Working on Fire programme (WoF), funded by the South African Government, is one of South Africa's most successful poverty alleviation, job creation and community upliftment initiatives. Please visit their website for more information or follow WoF on Twitter for daily updates. 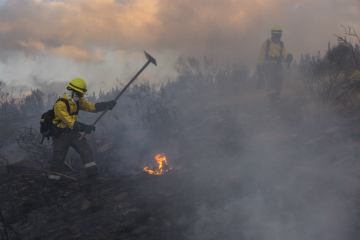 Find out how you can get involved to help fight wildfires in the Western Cape.